The HHF82 model has been discontinued. Please see the HHF-308 as a possible alternative or contact our Flow Engineering department. The HHF82 displays the flow rate in your choice of knots, meters per second, kilometers per hour, miles per hour, feet per minute. The builtin microprocessor circuit assures excellent performance and accuracy. The HHF82 can track the maximum and minimum values along with current readings. The HHF82 relies upon a lowfriction ball bearing mounted wheel design to provide high accuracy at high and low air velocity. 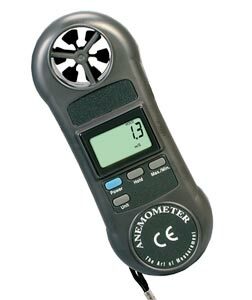 The impeller provides excellent accuracy (±3 to 4%) and the ability to measure the slightest breeze (0.4 m/s). The HHF82 offers many features including a hold to current reading, min and max readings, five types of air velocity units, low battery indication, auto power off and overrange indication. 참고: Comes complete with operator’s manual and 9 V battery.